Baltimore Ravens head coach John Harbaugh has admitted Joe Flacco will be "part of the game plan" in Week 15, even though Lamar Jackson is expected to be fit to play against the Tampa Bay Buccaneers. Quarterback Jackson exited Sunday's loss to the Kansas City Chiefs with an injured foot, which prompted third-string quarterback Robert Griffin III to finish the game. The rookie had taken over under centre with Flacco sidelined due to a hip injury, posting a 3-1 record in his four games as a starter. However, Harbaugh refused to make public his plans for the quarterback role against Tampa Bay as the Ravens look to maintain their playoff push. "It could entail anything right now," the Baltimore head coach said on Monday. "I know what we want to do. We have a plan, we've talked about it. We have to talk to the guys about it. Whether we share that with the public, we'll have to let you know as the week goes on." X-rays after the 27-24 defeat to the Chiefs came back negative for Jackson, who was selected with the final pick in the first round of the 2018 draft. 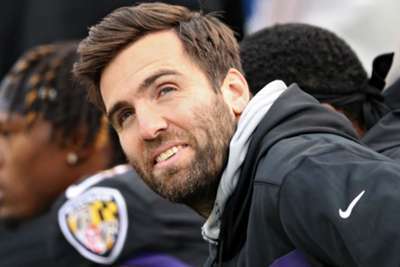 Flacco has not played since November 4 but seems likely to be cleared for action. "I haven't had a chance to sit down and talk with all parties yet involved, but I think it stands to reason that if Joe's ready to go, then he'll be part of the game plan," Harbaugh said. "He's too good of a player not to be. "We'll just figure that out as we go this week, to what degree how it works. Everybody will know going in, perhaps except everybody on the outside - unless I change my mind on that." The Ravens are 7-6 for the season and sit a half a game behind the Pittsburgh Steelers in the battle to win the AFC North.